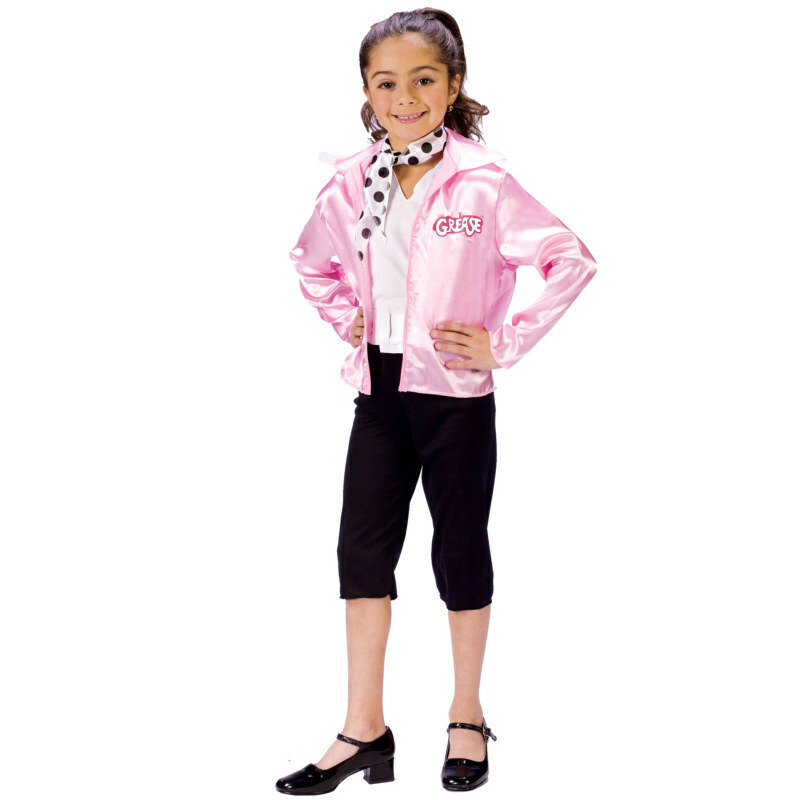 The Grease Pink Ladies costume includes a pink satin jacket with the Grease logo on the front, the Pink Ladies logo on the back and a faux zipper front (has the zipper teeth, but does not actually zipper up). A white v-neck top, black capri pants, a white belt and a black and white polka dot scarf are also included in this nifty fifties style! You'll be rock and rollin' and ready for your musical number in this costume! Available in Child sizes: Small, Medium (The following measurements differ from the size chart - Waist: 17-22") and Large (The following measurements differ from the size chart - 19-25"). Includes: Jacket, top, pants, belt and scarf. Costume measurements arre approximately: Small - Chest 24-25", Waist 17-24"; Medium - Chest 26-27", Waist 19-25"; and Large - Chest 30-32", Waist 18-26". 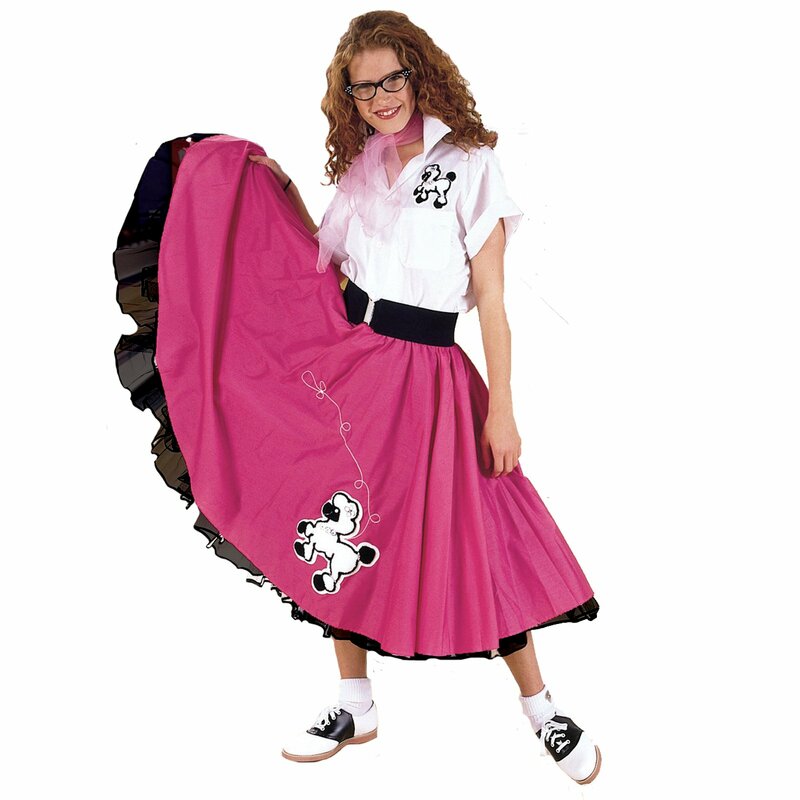 Check out our selection of fabulous fifties gear to find the perfect look for you! This is an officially licensed Grease T costume. Availability Large (14-16) (148940), Medium (10-12) (148941), Small (4-6) (148942) Orders placed by 4 PM CDT usually ship same day. Included Accessories Belt and scarf. Care Instructions Hand Wash in Cold Water separately. Line Dry only. No Bleach. BELT: wipe w/ damp cloth. LEVER COSTUMES Grease Pink Ladies Child Costume and interesting games are what make a Halloween party fun. Here are three costumes that are bound to provoke comment and laughter, and a game alled the "spook race" that fits right into the witch-ghost-goblin atmosphere of this October celebration. Dimensions for the costumes can be changed to ccommodate youngsters of different ages.